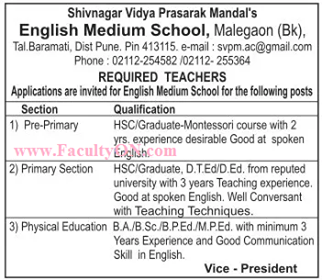 Shivnagar Vidya Prasarak Mandal's English Medium School, Malegon has advertised in Loksatta newspaper for the recruitment of Teachers jobs vacancies. Interested and eligible job aspirants are requested to apply by earliest. Check out further more details below. About School: Shivnagar Vidya Prasarak Mandal, Shivnagar was constituted in 1972 to bring the stream of education from pre - primary to diploma and degree level in the rural areas. It is sponsored by the Malegaon Sahakari Sakhar Karkhana Ltd. Shivanagar, Tal. Baramati Dist. Pune.The educational institutions are run under the visionary and dynamic leadership of Hon'ble Shri. Sharadchandraji Pawar, Minister for Agricultural & Food Govt. of India who is the president. Respected Shri Chandrarao Taware is the Vice President.The SVPM trust conducts professional higher education in Engineering, Pharmacy & Management.